We Caught One! SWIFT Sees a Supernova! Alicia Soderberg and her colleagues (I’ve since read that she was on a plane, and her friend actually noticed this) got very lucky. She had NASA’s Swift X-Ray Telescope pointed at a galaxy (NGC 2770 in the Northern constellation Lynx) when a supernova exploded right where she was looking. Although there are historically recorded observations of supernovae (1987A, Tycho’s Star, SN1054), never before has a telescope recorded the actual beginning of the outburst. Usually we see the remnant of the supernova, or catch just the middle or the end of the bright explosion. What Alicia saw is actually sort of the pre-signal for the supernova. We’ve seen the other stages of the supernova a few times before. Scientists have been predicting that the first event as a star collapses into a supernova should be a humongously bright flash of X-Rays. Unfortunately, by the time we detect a supernova in progress, this flash has already finished. No matter how fast our telescopes turn, we can’t catch the X-Ray flash – though we can get most of the rest of the supernova, including most of the visible-light flash, the brightening of the area, and the dimming away. Alicia and her team observed the bright flash lasting for about 5 minutes at 9:30 in the morning on January 9th of this year. Credit: NASA/CXC/Wisconsin/ D.Pooley et al. Caption: Chandra X-ray Observatory image of the region around SN 2008D, obtained about 10 days after the supernova explosion. 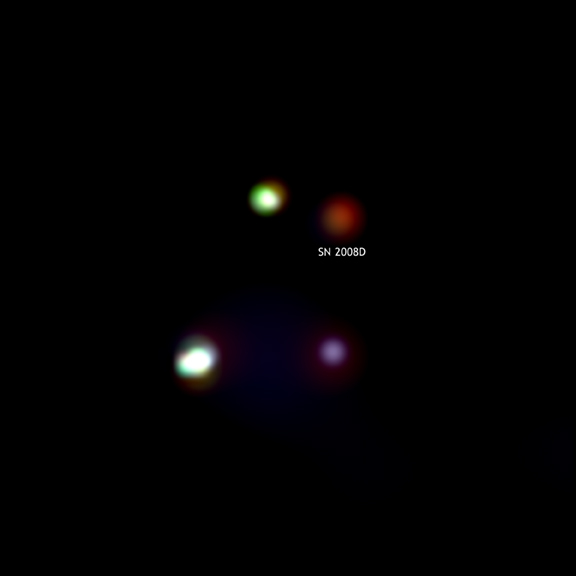 The faint red source in the upper right is SN 2008D. The other 3 X-ray sources are unrelated to this supernova. References: Soderberg et al. 2008, Nature, in press. Distance Estimate: 90 million light years.